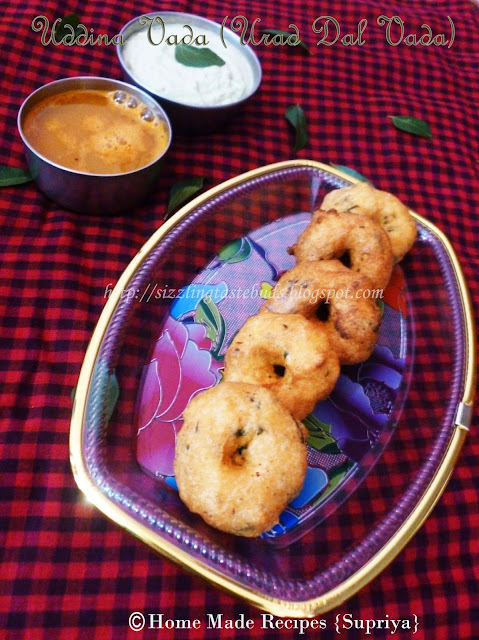 Urad Dal vada is also called as Uddina Vada in Karnataka. It is one of the typical South Indian breakfast dish which you can find in almost all the restaurants any time of the day. Myself and my brother used to insist mom to prepare this very often and she used to do this as she knew we both loved it and there's no need to alter the dish in any ways for us. I love this with coconut chutney. I prepare this rarely at home as somehow my little boy doesnot like it. Thats sounds weird for me! 1. Wash and soak urad dal for atleast 4-5 hours. 2. Drain the water and grind the urad dal adding very little water to get a smooth paste. (check notes) Transfer this to a bowl. 3. Add chopped green chillies, curry leaves, coconut pieces and salt to this. Mix well. 5. Fry the vadas on both sides in a medium heat till they turn golden brown. Transfer them over a tissue paper to absorb excess oil. 6. Serve this hot with coconut chutney and sambar. Consistency of the urad dal batter makes a lot of difference in shape and taste of the vadas. If the batter is too thick, you will find that its easy to get the shape but bit hard when fried. And if the batter is too soft, vadas absorb more oil and you won't get the right shape. So always try to prepare the batter thick and then add very little water to get the right consistency. Well prepared medu vadas. Delicious. wow so perfectly made all time fav snack :) looks fantastic dear !! Visiting ur space for the first time.Lovely recipes.Great go. So sft and delicious vada. Perfectly done.